The Assistant gardener has noticed on a few occasions that the area adjacent to the Harlequin Maple is really just a patch of half dead weeds. I rejoice in the fact that not even weeds can grow there happily, but apparently it makes the front yard less than perfect. Can we kill the weeds and maybe dress it up with a bit of mulch? Somehow from that simple statement, my gardener’s brain extrapolated the project into something a bit more extensive. We killed the weeds. We dug out a bit of the topsoil with the remaining and recurring weeds. We found some flat stones in the storage area in the side yard. They weren’t enough so we went to the garden center and bought 250 Lbs more flat stones. We went to the gravel purveyors and bought half a yard of pea gravel to put between the stones. The gravel needs to be kept separate from the planting bed so we installed some rubber edging that just happened to be in the shed. When it was finished it was a little more extensive than the Assistant Gardeners’s bit of mulch but we were both happy with the result and I’m quite certain that that area won’t be a weed problem for many years. 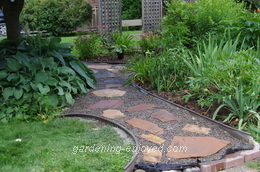 There is also landscape fabric under the gravel. While working at this “little” project, I continued my pursuit of the rabbits and chipmunks. Chipmunks are easy, four of them have been moved to their new country home. The rabbits are bit fussier and have eaten the offered enticements a couple of times without tripping the trap. We continue to look for more enticing bait. It’s a season of construction projects. In anticipation of the Town’s garden tour that visits my garden on the 19th of July, there is that list of things that just must be done before dozens, (hundreds?) of people wander through, to see just what it is that I write about. Surprisingly, not all of the things that I mention in my columns and in “Dallying” actually happen just as I say they do. With people coming to see what I write about, there is a certain pressure to finalize a few of the projects. The river was functional a few weeks ago but the interlocking stone walkway and the stone bridges existed mostly in the planning stages. They are now complete. Out front I’ve noticed a Rose. The actual plant was not very impressive. It struggled to recover from the hard winter and was pushing up some rather weak shoots. It had a few of its leaves attacked by one or more of the Rose Sawfly larva that do nasty things to Rose leaves. It was one of the Rose bushes that I received last spring in honour of Sheridan Nurseries 100th anniversary; it is named Anniversary Blush. I tried to kill it, last spring, by putting it out in the cold spring air but it managed to come back. This week it put out the loveliest sprays of soft pink blooms. 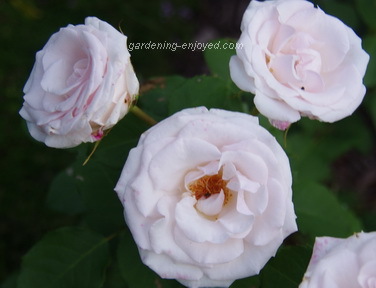 The original bloom fades to leave at least three secondary blooms that have the traditional Rose form and shape and a delightful fragrance as well. I’m not usually a pink fan but this Rose has managed to convert me. 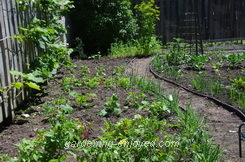 The vegetable garden has now been thoroughly weeded and cultivated. Every weed was thought to be dead and removed. It is disconcerting to go back to the South end of that garden, where we started this massive weeding project just over a week ago, and find a nice crop of small weeds quietly establishing themselves. Luckily a quick swipe with the hoe convinces me that we have once again eliminated these dastardly denizens. They will be back, I know, but if I take my hoe out for some exercise on a weekly basis then I can keep ahead of them with a rather quick passage through all of that bare earth. If the vegetables would just grow as quickly as the weeds then the bare soil would soon be covered and the weeds would have a much more difficult time getting established. The Onions are performing well and are providing an interesting border to that section of the garden. We have an abundance of Lettuce which, despite the stories, the rabbits will not touch; they much prefer spinach as their salad greens. The early Peas are grown on rings of wire fencing to keep them vertical and easy to pick. The added benefit, is the difficulty this creates for the rabbits. As a result we have had several succulent sweet meals of fresh peas. They are almost finished now and we will be pulling them out and planting a new crop of fall vegetables such as Cauliflower and Kohl Rabi in the next few days. I think I will just direct seed them into the garden and thin them as they grow to leave the correct spacing for each of these crops. This morning was municipal compost pick up day and as a result I spent the early hours of the morning in the front garden, deadheading Allium and Peonies and Iris and anything else that looked a bit unsightly or was taking up more than its allotted space. I was glad to see the truck picking up the bags that I was filling, because I could then quit and have a bit of breakfast. Everybody sent me pictures of crawly things this week and I am working at finding out just what they are. In Canada, the land of almost no pesticides, we take a certain delight in hand picking and crushing these nasty invaders. The squeamish among us wear gloves and some of us just get a weird sense of something from a bare fingered squeeze.